Gosh, has it really been a few weeks since I last wrote a post? I mean, I believe it, but somehow time has really flown by without me realizing it. I guess Victoria's been keeping me busy, huh? It's not that I haven't tried writing a post since the last time, it's just that every time I get a hot minute to myself, something always seems to come up that prevents me from writing anything. Well, luckily that wasn't the case today because I just saw something on Pinterest that really caught my eye and at the moment I'm not at the beck and call of Victoria. The photo above depicts exactly the way I like to see bookcases: books mostly filling the space with a few framed photographs and decorative items dotted throughout. 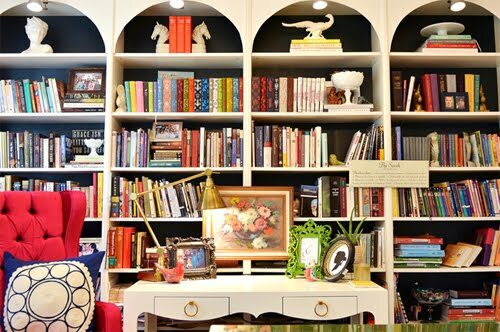 Don't get me wrong, I love seeing bookcases that are somewhat sparse with a few books sprinkled here & there along with beautiful objet d′arts accompanying them, but honestly that's not how we live. We've got loads of books and well if they're not in a bookcase, then where else are they going to go, right? I especially love that the bookcases themselves are white while the insides are black, really allowing the books and decorative items to pop. And how clever is it to place decorative items at the very top, highlighting the archways? And really, it doesn't hurt that there's that gorgeous white desk at the center along with a hot pink tufted armchair to really round out the space. This is a great example of why I love Pinterest so much.